Another Casey victory in Pennsylvania. 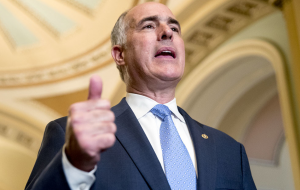 Incumbent Senior Sen. Bob Casey notches another 6 years representing Pennsylvania after defeating Rep. Lou Barletta (R-Luzerne). The Associated Press and other news outlets called the race for Casey immediately after polls closed at 8pm. Casey captured 55.6% of the vote to Barletta’s 42.8% with 99% of the vote reported. Like the gubernatorial race, the matchup between Casey and Barletta slowly faded from the national spotlight as the election cycle wore on, despite appearances in the state from former President Barack Obama and President Donald Trump to boost their respective parties’ candidates. Barletta attempted to paint Casey as out of touch with Pennsylvanians, while boasting about the Trump agenda. Casey’s message centered around protecting pre-existing conditions in the Affordable Care Act and holding the Trump administration accountable when he sees fit. There were periods of time in which Casey was in the ten most vulnerable Senators in the nation according to Roll Call, although his lead began to widen in the final weeks of the campaign.